Inter-VLAN routing is a process of forwarding network traffic from one VLAN to another VLAN using a router or layer 3 device. The VLAN tag used by the subif to tag outgoing traffic, and to use for identifying incoming traffic bound for this subif. This is an integer in the range 1-4095, inclusive. This VLAN must also be tagged on the corresponding switch configuration for the port used by the parent interface. The subif interface appears with the parent interface name and the subif id, joined by a ..
Next, configure the DHCP server and DHCP pool on TNSR for each VLAN. 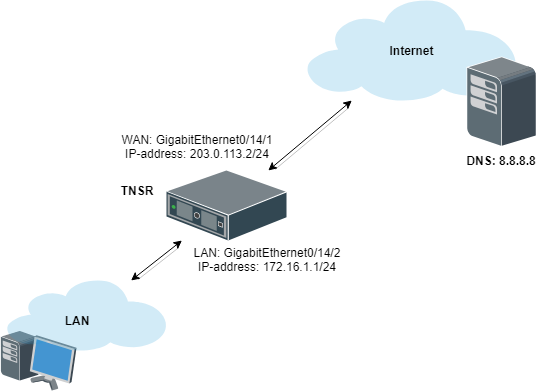 Now there are two VLANs on the physical “LAN” port and interface GigabitEthernet0/14/2 now works as trunk port between TNSR and downstream L2/L3 switch. This switch must be configured to match the expected VLAN tags and it must also have access ports configured for clients on each VLAN.